Trip hop and downbeat duo from Tromsø with a for many tongue twisting name. The Norwegians of course have no problems with it, just as we have no trouble with the word Common puffball (because that is what we are talking about here). 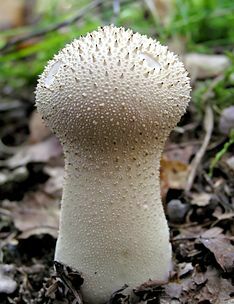 Don't think that Lycoperdon perlatum (which is the Latin name of the mushroom) can give you hallucinatory sensations; this fairly boring mushroom does just what its name suggests: when touched it scatters its spores.